Most health and welfare benefit plans, with limited exception, are subject to ERISA compliance regulations and requirements. For plans with more than 100 participants as of the beginning of the ERISA Plan Year, the requirement to prepare and submit an annual Form 5500 via the Department of Labor’s EFAST2 system can make even the most seasoned HR and benefits professional groan in frustration. 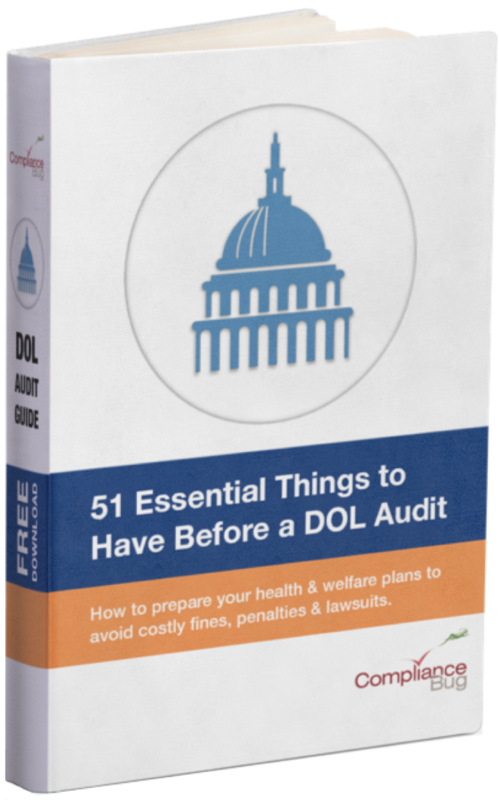 With the recent increase in the number of DOL audits, it’s important to know if you’re subject to filing an annual Form 5500 (or multiple Form 5500’s! 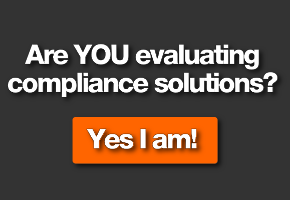 ), then you have a few additional considerations before you’re ready to mark this compliance effort as “done”. EFAST2 is the Department of Labor’s system of submitting Form 5500’s. It’s an acronym that stands for ERISA Filing Acceptance System II. Since 2009 all Form 5500 annual returns and reports must be filed electronically. Since 5500 filings must be filed by the end of the 7th month after the plan year has ended, employers need ensure the required information is gathered quickly in order to accurately file using EFAST2. This includes employee headcounts, financial data for various schedules, and other benefit specific data. Employers can face fines from the Department of Labor and/or the Internal Revenue Service up to $2,097 per day for not filing. 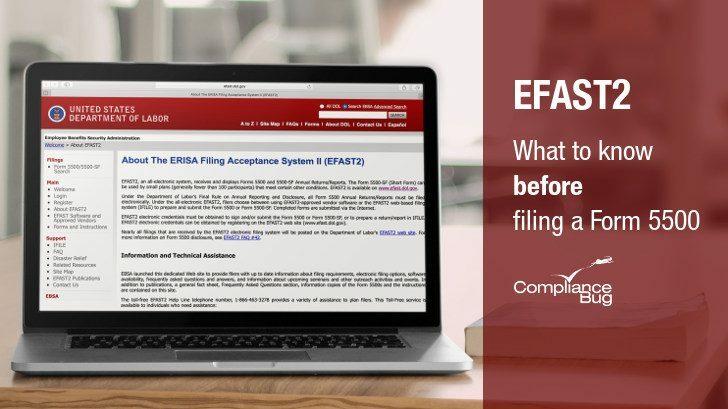 Once you’ve determined which plans require Form 5500s and the deadlines, here are three things you need to make sure of the following in order to use the EFAST2 system through either an approved vendor or the web-based filing system (IFILE). Who is preparing and reviewing the filing? This may be someone within or outside your organization. It can be a filing author or scheduling author. The filing author creates a filing with necessary forms, schedules and attachments and can assign others to share in the signing. Schedule authors can complete one or more of the filings but cannot initiate, sign or submit a Form 5500 filing. Some ERISA plan years do not coincide with calendar or fiscal years. Even more confusing is that start and end dates of a particular carrier’s policy (or vendor’s contract) don’t align with the formal ERISA Plan Year. In these situations, you need to ensure you are not skipping or possibly overlapping data from a previous (or future) filing resulting in an incomplete and inaccurate Form 5500 filing. Who will be signing the EFAST2 Form 5500? This can include plan administrators and plan sponsors. All signers must be registered with EFAST2 and have active credentials. One person, the transmitter, will send the completed Form 5500 to DOL’s EFAST2 system. One to three people can sign the Form 5500. Remember, the information on the form represents what is known of your employee benefits plans and some of that information (such as Schedule Cs) will be submitted directly to the government. Follow up with the transmitter and the EFAST2 system to make sure the Form 5500 was submitted on time, was complete and accepted by the EFAST2 system. Though the EFAST2 system was intended to simplify the Form 5500 filing process, it still takes time to gather all the information necessary for the filing, ensuring everyone has the proper credentials and follow-up to make sure the Form 5500 has been processed by the EFAST2 system. If you feel you cannot meet the your filing deadline, the Department of Labor has set up a way to request a filing extension. In an upcoming article, we’ll cover whether or not filing a Form 5558 extension could send a red flag about your plans.